The Philadelphia Furniture Show is a juried exhibition and sale of exceptional artisan quality furniture and is the longest running exhibition of its kind. Now in its 25th year, the show continues to set the bar for the finest heirloom handmade furniture and furnishings in the United States. 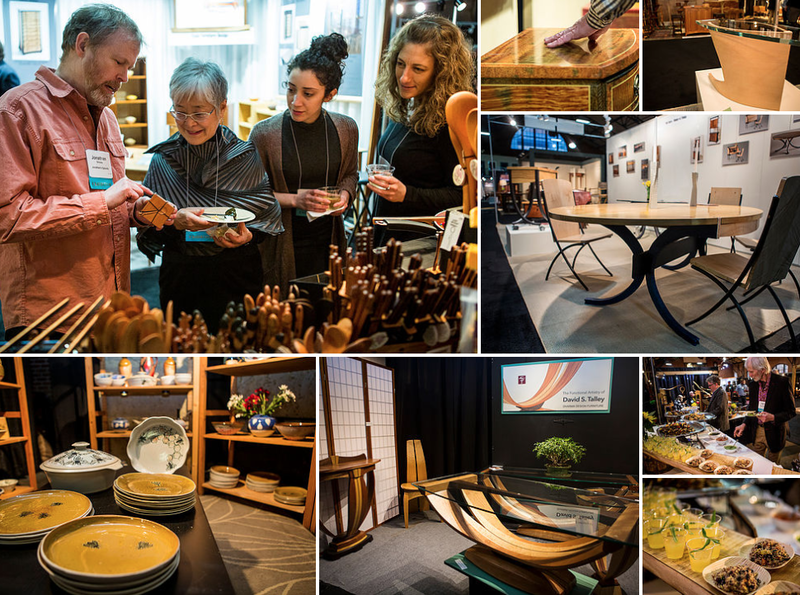 Held at the 23rd Street Armory in downtown Philadelphia, PA’s Rittenhouse Square neighborhood, PFS features 85-100 of the finest furniture makers in the US and beyond. Six jurors who are experts in the field choose up to 100 artists from a large pool of applicants. Artists are selected on the basis of the originality, conception, and craftsmanship of their work. The Philadelphia Furniture Show is primarily furniture with an allowance of up to 10% of exhibitors in the home décor, lighting, art and ceramics categories. PFS employs a professional PR team that is local to Philadelphia with national reach. We also work with partner organizations, sponsors, luxury retail and lifestyle organizations/companies, interior design associations, architectural associations, social media channels, print and radio advertising channels and promotional ticket outlets. In addition, PFS creates a digital Look Book which is promoted to buyers via our website, social media, e-newsletters and show partners. Our 2018 Look Book had viewings from countries as far away as Australia, Canada and Brazil and had an average viewing time of 1 hour, 17 minutes per viewer. Once this digital Buyer Book gets released, there’s no limit to the number of people who will learn about your company and work! PFS attracted a qualified audience of 2,400 in 2016, 2,520 in 2017 and 2,680 in 2018. Attendees are affluent, educated and are actively in the market for furniture of the finest caliber and commissioned work from our exhibitors. Expected attendance in 2019 is between 2,500 and 3,000. PFS features 85-100 exhibitors with expected attendance of 2,500-3,000 attendees in 2019. Electronic applications are due by June 15, 2018. The fee for applying is $30. NOTICE: The application fee is non-refundable and due at the time you fill out the online application and accept its terms and conditions. Order additional booths and get $100 off each additional space! For example, a 10’ x 20’ booth would be: $1,100 + $1,100 - $100 = $2,100. A 5’ x 20’ booth would be $600 + $600 - $100 = $1,100. Each applicant must submit an application, the non-refundable fee, and four (4) electronic images of their work plus (1) electronic image of their booth display (if available) for consideration by the jury. The images must be fully representative of the work you will sell at the Philadelphia Furniture Show. Minimum image resolution should be 300 dpi and 1400 pixels on the shortest side and no more than 4000 pixels on the longer dimension. Artists are encouraged to update their portfolio with new images and consider improving the quality of previously submitted images to meet these specifications. You will be able to check your application after you have set it up in the system. This feature enables you to access your application as it will appear to the jury and: 1) edit the copy submitted up until June 15, 2019; 2) verify that your payment has been received (if you find your payment has not been received, please call the Philadelphia Furniture Show at 207-781-2982 x180); and 3) find the results of the jurying process. Results of the jurying process will be emailed to each applicant by June 20, 2019. You will be notified of your status directly after the jury's decision on June 20, 2019. The Philadelphia Furniture Show will post one image from each exhibitor in the online ‘2019 Exhibitors’ page of the Philadelphia Furniture Show’s website. Additionally, each exhibitor will receive a listing in the show guide, complete with contact information and one image. Information and images will be taken directly from the Juried Art Services website. Correct identification for your images. The Philadelphia Furniture Show encourages the makers of tomorrow with the Emerging Artist Contest & Award. Applications for the 2019 contest will be accepted starting January 15, 2019 via philadelphiafurnitureshow.com. The winner receives a free booth complete with surround/pipe and drape and needed electricity & lighting, as well as a mentorship session with a member of The Furniture Society. The Philadelphia Furniture Show reserves the right to refuse submissions which fail to meet the high level of quality determined by show management and jury standards. If accepted, exhibitors must display work consistent with the type and quality represented in the submission. PFS reserves the right to require removal of items which, in its opinion, are inconsistent with the application submission. All fees for show applications are non-refundable. Accepted exhibitors will be required to sign a Contract of Exhibition prior to being confirmed for the show. A 30% deposit of the total booth fee is due at contract signing, with the remaining balance due by August 31, 2019. Failure to meet payment guidelines will result in the cancellation of the contract and any fees paid up to the time of cancellation will not be refunded.